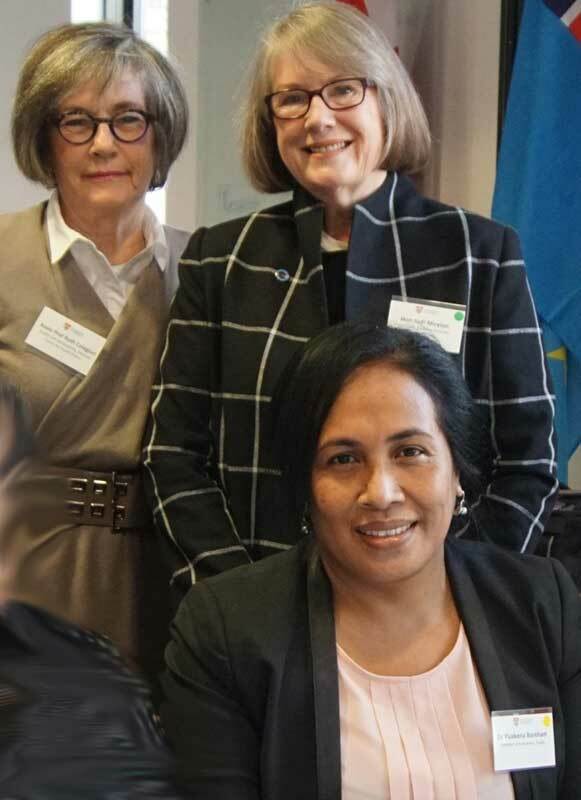 The Hon Dr Puakena Boreham, Tuvalu’s only woman MP and the Hon Judi Moylan, a former member of the Australian House of Representatives, have formed a partnership that is positively influencing government action on diabetes prevention in Tuvalu. L-R: Associate Professor Ruth Colagiuri with Hon Judi Moylan and Dr Puakena Boreham (front) at the Menzies Centre for Health Policy at Sydney University. They were part of a forum for women leaders in academia and politics supported by the PWPP project. The PWPP project has offered the two women a number of opportunities to work together, learn from each other and advocate on their common goal. Non-communicable diseases (NCDs), including diabetes, account for 75 percent of deaths in the Pacific. As a medical doctor, Dr Puakena Boreham felt constrained at only being able to manage the treatment of patients with diabetes. Ms Moylan spent 20 years as an Australian politician and established the Parliamentary Diabetes Support Group. Parliamentarians in the Parliamentary Diabetes Support Group show leadership in promoting community education, effective policies and healthcare for sufferers of diabetes. Since retiring from parliament, Ms Moylan continues her advocacy work as the current convenor of the Parliamentarians for Diabetes Global Network. The two women met at the Menzies Centre for Health Policy at Sydney University at a forum for women leaders in academia and politics, supported by PWPP. Later, with further support from Pacific Women, they travelled together to Canada for the Parliamentarians for Diabetes Global Network Forum. There, Dr Boreham addressed parliamentarians from 31 nations on the challenge of diabetes in island nations. 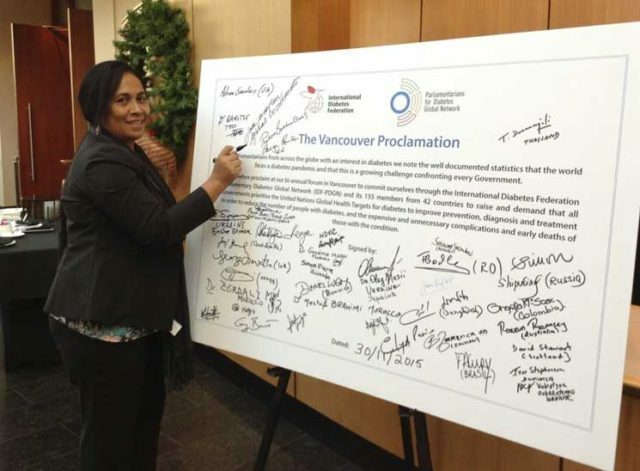 Along with parliamentarians from other countries, she signed the Vancouver Proclamation calling on governments to provide universal health coverage for everyone with diabetes. Through the PWPP project, Ms Moylan has been able to share with Dr Boreham her experience and networks as a parliamentarian advocating on the issue of diabetes for two decades. This has assisted Dr Boreham to take steps in her own parliament, including successfully establishing Tuvalu’s first Standing Committee on Health. Dr Puakena Boreham at the Menzies Centre for Health Policy at Sydney University. She was part of a forum for women leaders in academia and politics supported by the PWPP project. Photo: PWPP.